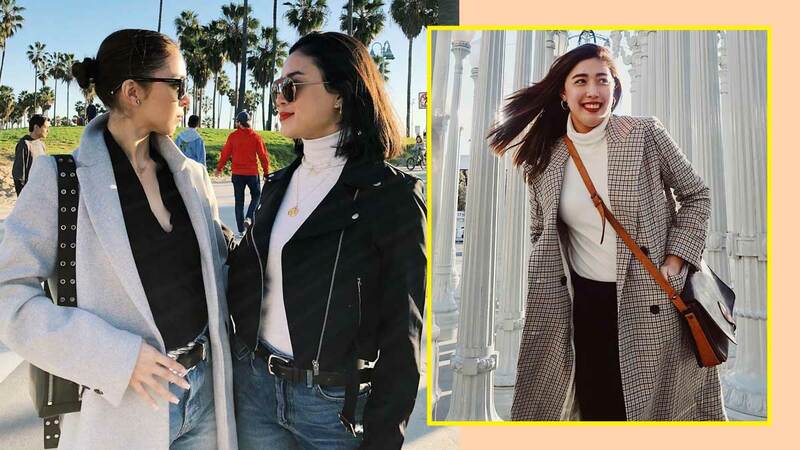 Sisters Dani, Julia, and Claudia Barretto spent the holidays in Los Angeles, California with their family, and you bet they packed the most stylish outfits for the trip. Here, we rounded up their best looks and took down style notes you can use the next time you jet off somewhere chilly. Layer a statement maxi coat over your monochromatic outfits to look put-together instantly. Whether you decide to go for plain-colored ones (like Claudia's gorgous green number) or plaid (like Dani's! ), maxi coats are guaranteed to up any outfit's game. If you’re lamigin, stay warm in style with edgy leather jackets worn over soft tops and dresses. Take a cue from Claudia and Dani: Opt for neutral-colored turtlenecks underneath your coverup. One of the easiest style tricks we’ve learned from celebs is to pick out a color palette for no-fuss OOTDs when traveling. (For example, Kris Aquino admits she usually sticks to all-black outfits when going abroad because you can't go wrong with them!) When going somewhere chilly, try packing lots of versatile neutrals you can reuse for all your OOTDs. Corduroy is back! Ditch your go-to denim jacket and layer on an oversized curduroy jacket to add some character to your outfit. This '70s staple isn't only fashionable, it's also functional, as curduroys also provide ample warmth in the cold. Love how Julia paired hers with cropped wide-leg jeans and pointy boots!